Castries sidewalk crossed this section which smelled worse than it looks. Ever the budget cruisers, when anchored, we tend to walk a lot. There’s no car on the boat. We’re usually too cheap to rent a car or taxi. We’re not willing to commit our meager space to accommodate a cycle, motorized or otherwise, though we’ve debated about it. Busses, when available, are appreciated when we’re going far enough to make it worth our while, and they’re going where we want to go, or at least getting us close. Most often, we walk for reprovisioning – grocery runs or farmers markets when we’re lucky. Sometimes it’s for fun, exercise and exploration. Unfortunately some of our longest, hottest, dustiest and most frustrating walks are for boat maintenance and repairs. Given all that walking, we’ve noticed distinct territorial differences when it comes to sidewalks. 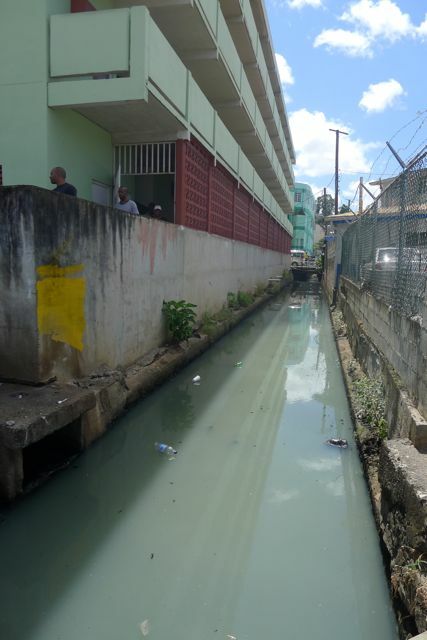 Stinking effluent running under or alongside broken concrete sidewalks, street shoulders and urban footpaths are typical of our strolling experience in current or former British territories. Downright unpleasant. These include St. Lucia, Dominica, Antigua, St. Kitts, St. Johns (US but the British influence appears more dominant than US intrafstructure, perhaps due to its smaller populace). 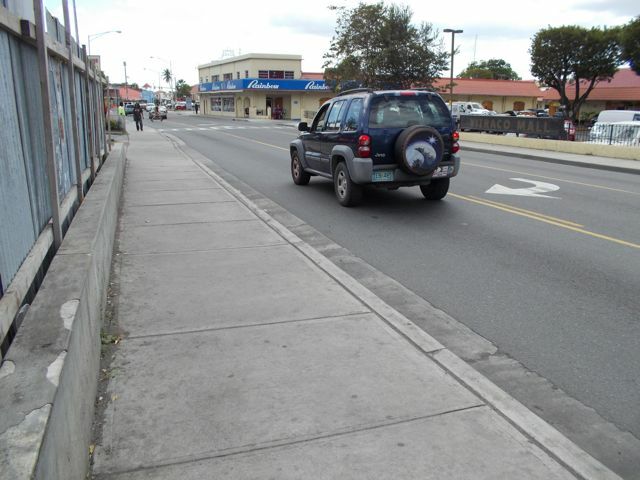 Usually, in French Territories there are no sidewalks, except for Oceanside promenades. When there are sidewalks, they become multipurpose spaces… for trashcans on sidewalks narrow enough to push you back out to the street, or for parking – not next to them – on them. 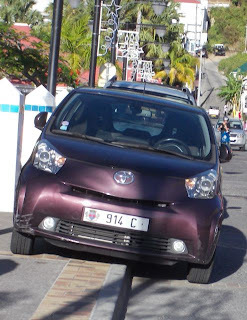 Of course, if you sidestep a trash can and step into the street, as we often had to do in St. Pierre on Guadeloupe, you will get “beeped” by passing drivers to get back on the sidewalk. Big. Broad. Solid. Prevalent. Bordered by strip malls, fast food franchises, apartment complexes, all with ample parking lots, with plenty of room for cars speeding by on wide roads to park, eventually. Sidewalks in St. Thomas reminded us were back in US territory. The sidewalks, the main thoroughfares like the construction, looked like they were built to robust, high use, industrial standards. Ugly, but very very functional. Much like driving down Highway I-5, not very inspiring, but efficient. Like a McDonald’s, you knew what to expect. hand side of the street? True, despite US territory status. For better or worse, the sidewalks and traffic made us feel like we’re back home, in the U.S., sort of. That is, unless you want to replace the arm that props open a boat hatch from a mail order company that refuses to mail anywhere outside the contiguous US. Or if you’re used to drivers on the right hand side of the road.